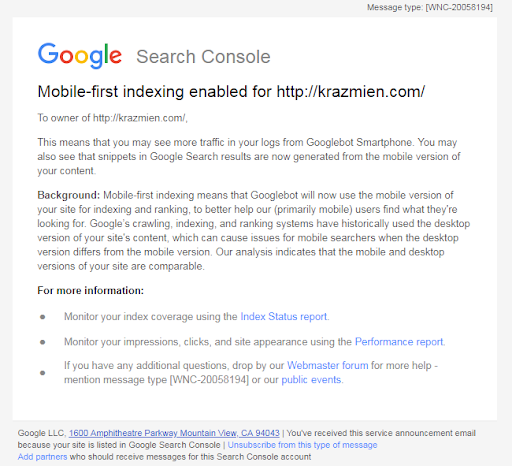 Sep 20, 2018 | By: John K.
If you have Zibster Builder and you’re using Google Search Console (formerly Google Webmaster Tools) to track your website performance, you may have recently gotten an email like the one below, telling you that “Mobile-first indexing” has been enabled for your website. Your Zibster website is mobile responsive. You have peace of mind knowing that your website provides the same exact experience and content for desktop visitors as it does for mobile visitors. On top of your website content being the same, our powerful SEO tools ensure that your website has the same metadata (meta title, meta description, and meta keywords) as well as sitemap submitted to Google as well. These practices are preferred by Google.